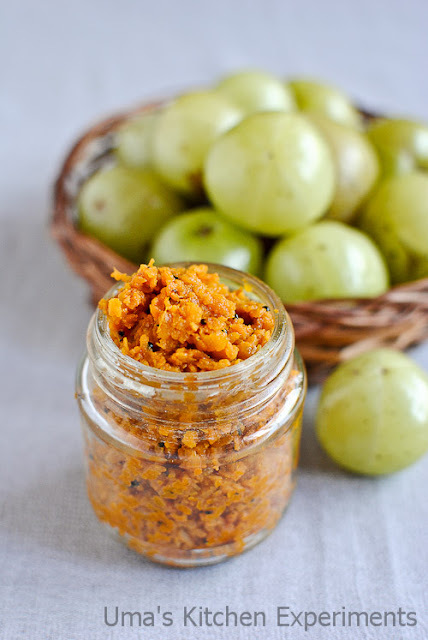 Being an Amla Addict, I am feeling guilty to have only 2 Amla recipes in my blog. 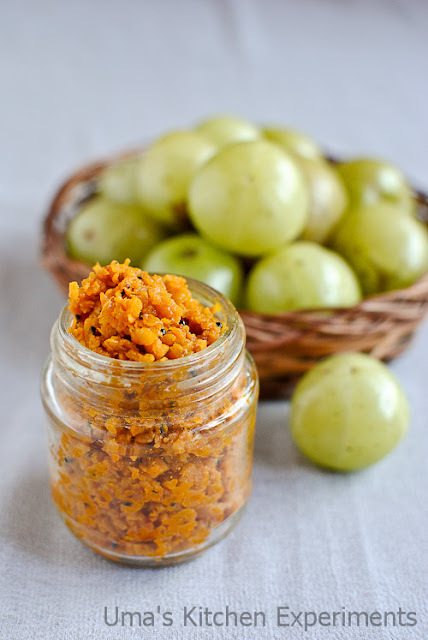 As I am getting it in larger quantity, I keep on postponing the amla based recipe preparation every time. Hope I don't repeat it next time and prepare some recipes and post them here. 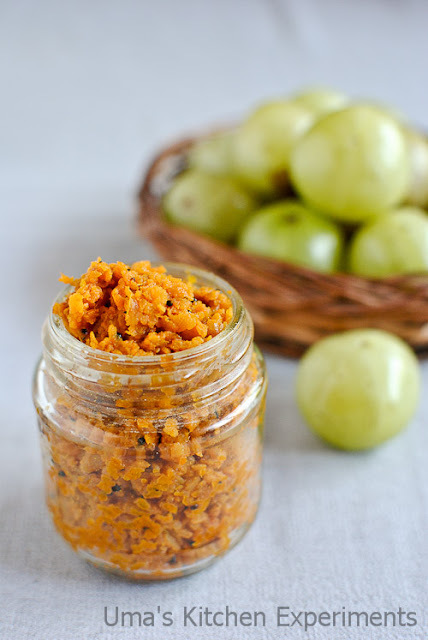 Today's recipe is kick start for it and it is amla based, an instant grated Amla. The preparation is similar to Mango Thokku, but I didn't add jaggery to it as Amla tends to give slight sweet taste after eating it. 1) Wash and pat dry the amlas. Grate them using a carrot grater. Keep aside. 2) Heat oil in a pan and add mustard seeds when it is hot. 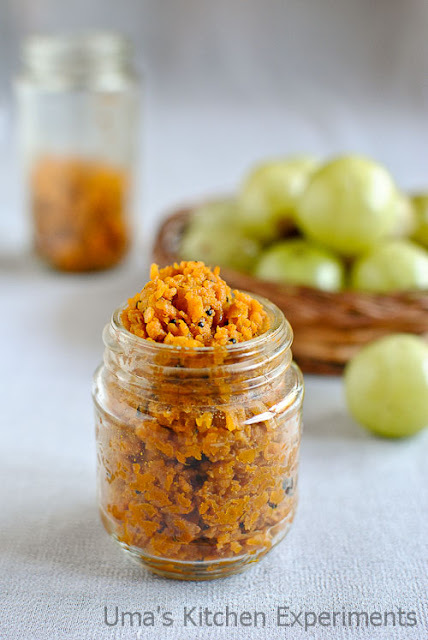 3) Add asafoetida followed by grated amla. Mix well. 4) Sprinkle 2-3 tablespoons of water. Cover and cook for 5 minutes. Instead of water, you can also add oil for long shelf life. 5) Add turmeric powder, roasted fenugreek powder, red chilli powder and salt. Mix well. 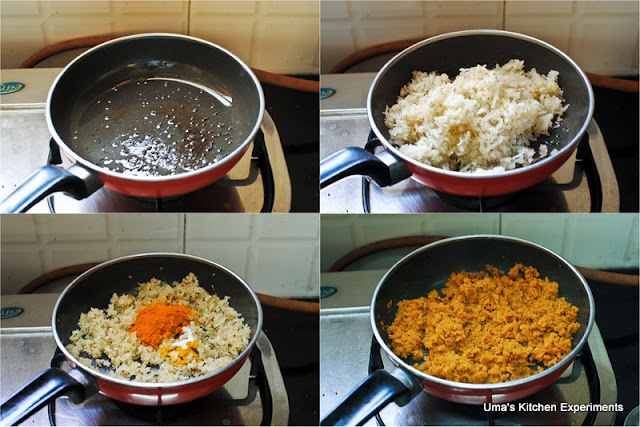 6) Continue cooking till the raw smell of the masalas goes off and oil oozes out from the sides of the pan. 7) Allow it to cool for room temperature and store it in a air tight container. 1) addition of water to the amla is optional. You can cook it in slow flame by adding additional tablespoon of oil. 2) I stored it in refrigerator and it stayed good for 2 weeks after preparing it. 3) I added homemade red chilli powder and hence added 2 tablespoons. If you use store bought red chilli powder, use it as per the spicy level. Great recipe Uma. I think you couldnt have posted it in a better time. I have some amla in the fridge and I was wondering what to do with it. Thanks for the recipe. would love to try amla this way too. appreciate if you stop by at my space too. too good wld be nice with curd rice..
thokku looks yummy ..beautiful clicks..
tongue tickling one..looks healthy & delicious!! Looks mouthwatering delicious. You post things that make my mouth water. Oh, tasty and tangy pickle. never made thokku with nellikkai. Nellikkai very good for health!nice recipe!